Revealed today during a panel talk at Devcon2 by Ether.camp founder and ethereum Java client developer Roman Mandeleil, the news was confirmed by representatives of Santander. In statements, Santander said its goal is to open up its bank-issued funds to a community of innovators as a way of tapping additional efficiencies. Given the recent deluge of proofs-of-concepts and consortium announcements, Santander’s move to potentially issue digital cash on a live public blockchain emerges as one of the more unique projects globally. Running for more than a year, the ethereum network has a market cap of more than $1bn and nearly 40,000 in daily transactions. In interview, Mandeleil explained that the Santander project envisions how the bank’s customers could convert money from their real bank accounts into a ‘tokenized’ online currency called ‘Cash ETH’ that would be redeemable for paper currency. 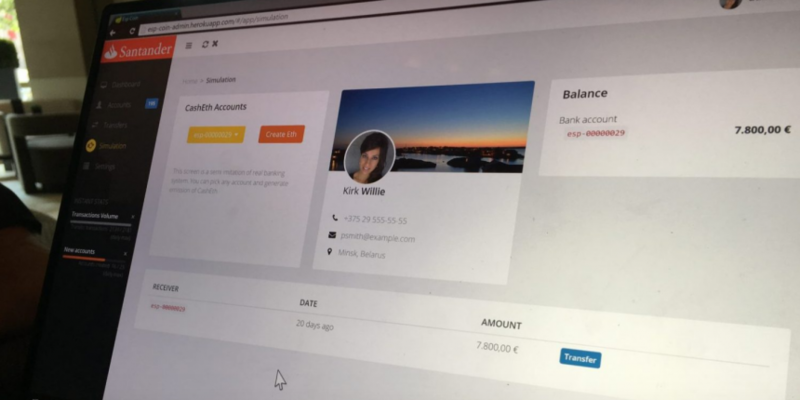 In a demonstration, Mandeleil showed how a fictional customer could use the prototype to create digital money for use at online merchants and accessible with a mnemonic passcode called a brain wallet. (Despite past issues with the concept, he called this version “statistically hard to break”). Santander representatives indicated that the bank is now seeking to work with Ether.camp on engaging other banking partners in the project. The two partners are also looking to run hackathons that would focus on developing use cases around micropayments. In essence, the project aims to envision a way for banks to open up their basic bank account offerings to new ideas and transactional services. Further, Mandeleil said the project is part of his 10-person startup’s vision that focuses more on using blockchain technologies to achieve incremental benefits for banks and consumers. “It’s more like evolution, not revolution,” he said. Still, he emphasized that the trial, should it go live, would mark a “huge leap” by establishing a connection between a publicly traded financial firm and and a public blockchain. “You can start to build more and more stuff and say to the regulators ‘It’s not so scary,'” he continued. Elsewhere, in his talk, Mandeleil discussed Ether.camp’s work with blockchain startup firms including Gemini and Rootstock. 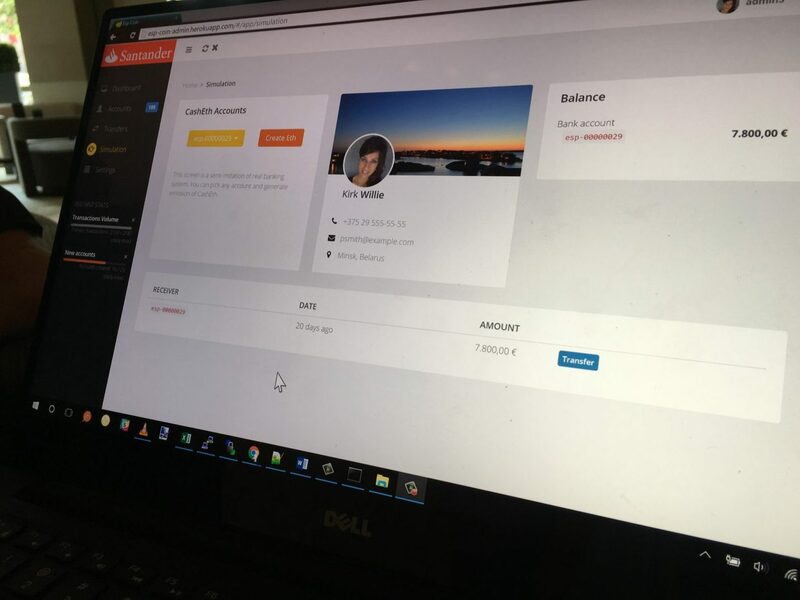 Mandeleil showcased a system whereby a Santander customer would have three new options to coincide with their traditional bank account – tokenize, transfer or refund. Should the user elect to ‘tokenize’ their funds, the system is set up to allow for payments of as low as $0.01, though small charges may add to Santander’s earnings depending on how the user chooses to allocate the funds. In the example, $350 in funds were withdraw to a test version of the ethereum blockchain, with $1 going toward gas payments, which are needed as payment to execute transactions on the network. By paying the gas upfront, the user is allotted a certain pre-set number of transactions they can execute, though this figure can be increased with additional payment. Mandeleil sees the digital Santander dollars as a viable alternative to PayPal. “It’s not something that users will not do to have the agility of money. You click on the payment, then you put in the private key and you have the balance and the reliable transactions,” he said. 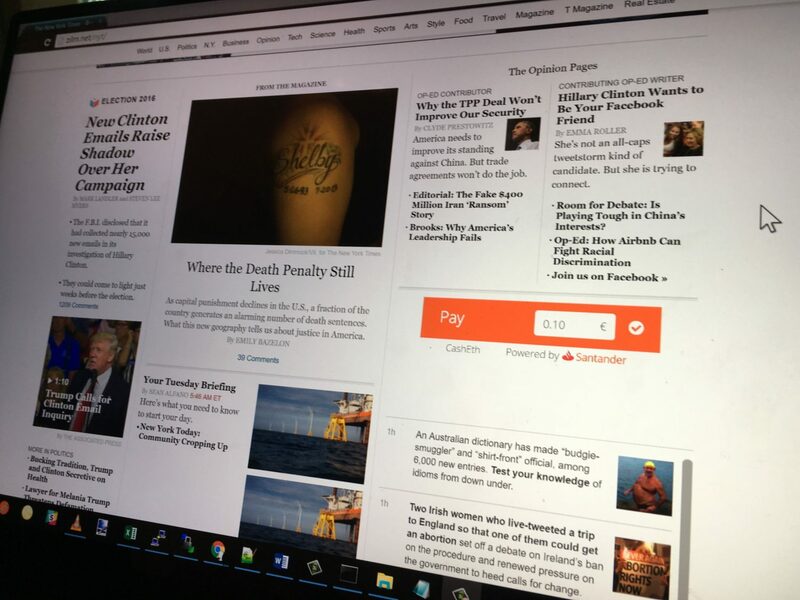 To offer a better view on the project, Mandeleil walked CoinDesk through a version of the prototype in which a user tokenized funds for use as payment for an article on a demo version of The New York Times website. Users could then exchange the digital money with other users, though Mandeleil said these funds would be redeemable with Santander. In this light, the partnership also offers the bank a new avenue by which to add to its accountholder base. According to Mandeleil, the project first began seven months ago, when Santander approached the Ether.camp team with the idea for the effort, but more work remains. Should Santander succeed in receiving regulatory approval to ultimately move forward, it will need to contend with the challenges of potential growth. For example, Mandeleil said he is speaking with Santander about the issues that could arise from a broad number of banks all issuing their own versions of digital cash, which might lead to interoperability and settlement issues. Mandeleil, though, sees the current blockchain market as already providing relevant examples for how workarounds to this could be achieved. For instance, he mentioned the available cryptocurrency conversion tools as one service that could offer a potential solution should the project progress. Going forward, Mandeleil and Santander said the partners are seeking to engage more banks in the project, which they compared to the Universal Settlement Coin project spearheaded by UBS and also involving Santander. Representatives of Santander said that additional legal work needs to be done before moving forward, and that it is currently exploring whether it needs additional licensure.